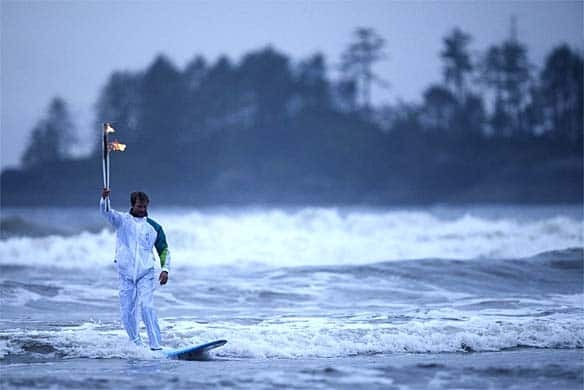 The torch for the 2010 Winter Olympic Games in Vancouver has been carried by runners, in a plane and a dog sled, but also by water in a canoe, kayak, ferry, surfboard, and a sailboat. HAIDA GWAII, BC - Nov. 4, 2009 - Bill Reed's carved canoe "Loota"
Day 47: Former Olympic sailor Tim Irwin, who competed for Canada at the 1968 Olympic Games in Mexico, sailed the torch into Kingston's Portsmouth Olympic Harbour on Day 47 to pass to the first Torch bearer of the day. Irwin is the chairman of the board of directors for the Canadian Olympic Training Regatta Kingston. The Tetra statue in the harbour was built for the 1976 Olympic sailing events.